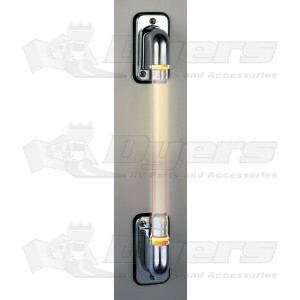 Add a friendly glow of welcome in the dark night with the Lumagrip clear acrylic grab bar with chromed plastic end caps. Top and bottom gasket and mounting screws. Top Screw Hole to Bottom Screw Hole - 16-1/2"
Bracket - Top to Bottom - 4"
Bracket - Between Top and Bottom Screw holes - 3-1/2"
Love it! Well worth the upgrade!